This is a long, fast-moving occult fantasy about a magician's apprentice who sets out to develop his powers in secret beyond the current stage of his training - as apprentices usually do. First he calls up an imp, then names and summons a djinni, a 5,000 year-old demon of the middle rank. The story is told from both points of view, third person for the boy, Nathaniel, and first person for Bartimaeus the djinni, whom readers may find an attractive rogue with his laid-back style and footnotes which set the scene for this alternative world with a rather different course of history. 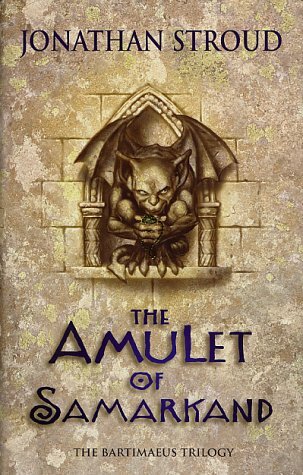 Nathaniel desires to master the djinni to get him to steal the Amulet of Samarkand, a prized artefact which has already been stolen by a treacherous magician. Nathaniel simply wishes revenge on this magician who insulted his inexperience when visiting his master, but he is then caught up in a highly dangerous plot to overthrow the government, and is soon on the run, encountering a 'Resistance' of teenagers against the rule of magicians. The story is a gripping cycle of spying, chasing, transformations, capture and escapes. I also enjoyed working out the world's history: it seems the magician-demon symbiosis has gone on for thousands of years. There was a Great War, but with Czechoslovakia, not Germany, no World War II, but a European conflict still going on: Britain still has an Empire. Gladstone was a powerful magician who 'brought the feuding factions of magicians under government control'; and there are plenty of topical and witty allusions to pick up. The film rights have already been sold. Usually in children's fantasies about wizards' apprentices, such as those by Rowling, Le Guin, Wynne Jones, Duane and Pierce, the young person has innate magical powers which are then developed by study and memorising spells, often channelled through a wand or staff. In Stroud's universe magic is only created by summoning demons and using their powers, or by employing artefacts. Nathaniel's master owns two large bookcases containing a lifetime of learning. Demons, however, are an unhealthy source of power: adult fantasy authors and the vampire slayers of Buffy treat them with respect. If there is a chief supernatural evil, Bartimaeus has not told us, nor do we read of a countervailing source of good magic, as we find in children's fantasies, delegating its powers down through gods or angels to child-heroes (though Westminster Abbey still stands, and certain demons are destroyed by 'the sound of church bells'). I am therefore intrigued about the cosmology in this first volume of a trilogy, suspect that Bartimaeus doesn't know everything, and wonder if the teenage resisters have innate powers not known to the ruling magicians. With its occasional violence and life-or-death episodes I would consider it more suited to the teenage section of the publisher's catalogue, for 12+ instead of their estimate of 9+, and I look forward to parts 2 and 3.